Diaper-on-the-head is a big hit at our house. The funny thing is that I used to be irritated by babies crying on airplanes or in grocery stores, but figured it would bother me less if it were my own kid. In fact, it bothers me so much more… My screaming baby absolutely shreds my nerves from the inside out, sending me into an instant, adrenalin-dumping panic. I think it’s instinctive. We are probably hardwired to immediately react to our infant’s cries in order to protect them and help them survive. Fortunately, our biology also wired us to feel incredibly good whenever our baby smiles or cuddles us. It’s part of what keeps stressed parents from running screaming from the house in a moment of panicked desperation. Most parents would admit, if totally, 100%, honest, occasionally fantasizing about grabbing the car keys and tearing off into the night, blasting music on the car stereo and drinking in the heady freedom. But we don’t, because for every moment of parental agony, there are even greater moments of incredible bliss. Possibly the most awesome feeling in the world is hearing your baby laugh hysterically. Sometimes it seems completely random. You will snap your fingers or something, and your baby will throw back its head and laugh like you just told the best joke in the universe. It makes you giggle too. You wonder what’s going on in their little heads, what could possibly be hilarious about snapping your fingers and you will continue to snap your fingers, over and over again, for as long as the baby continues to find it funny. The other day, my husband and I went out to the golfing range to hit a few balls and brought our daughter in her baby-carrier. We figured we would run through a quick basket then go about our day. Unexpectedly, Brontë found this absolutely hysterical. I’d swing at the ball, it would make a popping noise and fly off, and she would explode into uncontrollable giggling. Thinking at first that it might be a coincidence, I continued to hit golf balls and she continued to explode into choking laughter until she was absolutely crying. This may have been the funniest thing my husband and I had ever seen. I have no idea why it was so comical to her–the giant stick hitting the tiny ball? The satisfaction of making something fly far away? She can only say a few words, so she couldn’t explain it to us. It can be hard to predict what will amuse your baby, but I have discovered that placing objects out of context is a good bet. Babies don’t understand very much about the world around them yet, so if you start to mess around with what they do understand, they can appreciate the wackiness. Something “unexpected” will amuse your baby. A bit hit around our house? Putting Things On Your Head That Don’t Belong There. Walking around with Brontë’s bottle on my head usually gets a laugh. When the cat crawled into her car seat, she thought that was pretty knee-slappingly funny. The piece-de-resistance, however, is our diaper-on-the-head gag. Brontë knows where diapers are supposed to go… certainly not on one’s head. 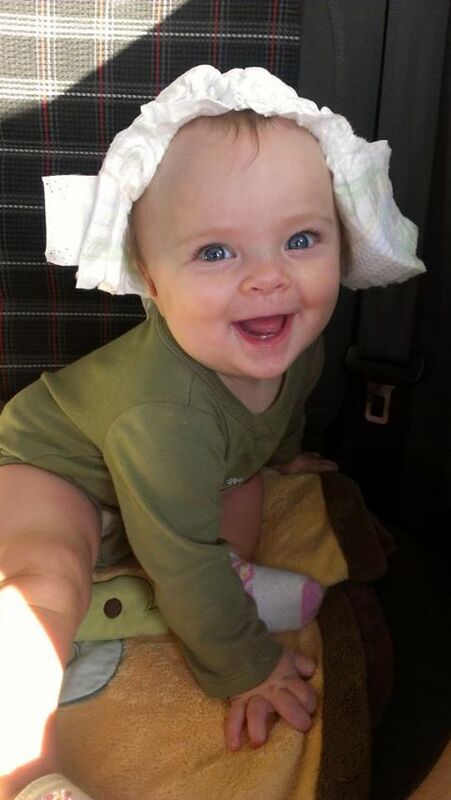 Putting her diaper on your head will not only get a chuckle, but she will grab it and and put it on her own head like an infant comedienne. It has turned into an inside joke around here.